"As a co-chair of the All Party Parliamentary Group on Human Rights in collaboration with the Raoul Wallenberg Centre for Human Rights, I have been monitoring the case of one of our world’s most courageous human rights defenders, Iranian lawyer Nasrin Sotoudeh. With Senators Raynell Andreychuk and Linda Frum, the [below] open letter went to our colleagues. 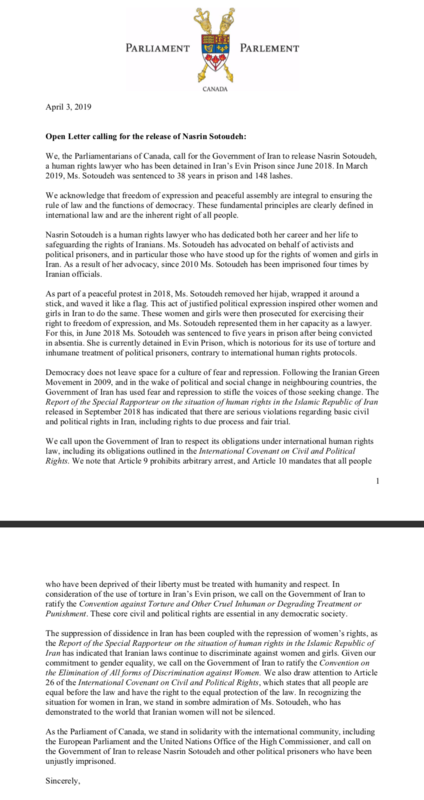 Parliamentarians across the political affiliation spectrum signed with us in calling on the Government of Iran to release Ms. Sotoudeh, who has been detained in Iran’s Evin Prison since June 2018 due to her activism and legal support for other women’s rights defenders in Iran. Our concern was intensified a few weeks ago when Ms. Sotoudeh was sentenced to 38 years in prison and 148 lashes and is reflected in the open letter." To read the open letter and the full list of signatories, click here. Learn about the Centre’s work with political prisoners.